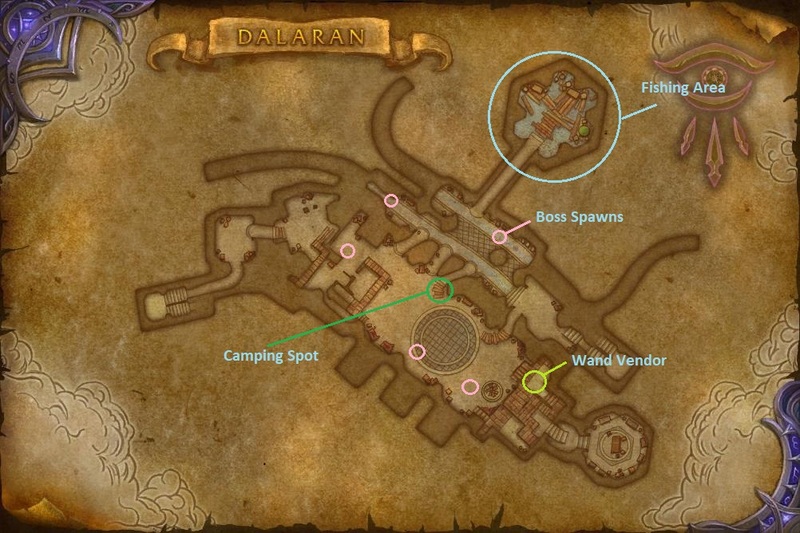 Underbelly is Dalaran’s sewers, and it has 3 entrances: the one by Krasus landing, the one near the Council of Six tower, and also you could jump into the well by the Horde’s quarter bank. Underbelly is simple. There are two modes: either the Underbelly guards ‘take a break’ (allowing PvP) or they are on guard (PvP is forbidden). Underbelly Sightless Eyes come from either looting chests (PvP mode) or looting Underbelly bosses (PvE mode). Obviously I go for bosses. The bosses are marked with a star, and you must be quick to run there when it pops and plant a shot (much like world quest rare kills). If you’re at least LFR-clad from Antorus, they’re a piece of cake for any class solo, so don’t hesitate to engage a combat. One boss drops ca 50-130 eyes. There are wands sold by a goblin vendor where you can spend your earned eyes – applied to a boss 90%+ health, the wand increases its damage and HP, but also Underbelly eyes reward when killed. I started it all with my warlock – it is convenient to jump in your Order Hall portal to drop the PvP mode, but for other classes it’s a little farther run upstairs to the city. Check if PvE mode is currently active (both PvP and PvE are marked as a debuff upon your entrance to Underbelly). Standby at the marked camping spot. Here you will see every boss and have a quick access to every boss even without speed spells (like my warlock). Check the map for the boss arrivals. When they do, go and kill them! If you have a wand, you need to be very quick to apply it while a boss has 90% health or more. Spend all the earned eyes on the wands. When PvP mode goes up (it is announced as ‘guards take a break’), run to the city upstairs, or use an order hall portal if you’re a lucky warlock. Try and grab the spare chests on the way if PvP is not going on. Be careful, as looting takes a while. Wait for the guards to return to their posts, repeat. The cycles of guards’ breaks take roughly from 1 to 20 minutes, and are pretty quick. So you need to check for the current mode constantly not to miss your bosses. Fishing area (or Black Market zone) – spawned fish schools are also a source of Sightless Eyes, but it’s not worth it. You can’t fish in peace in PvP mode, and during PvE you just won’t be able to reach the lower level bosses in time from there. The bosses grant much more, so you’d better camp them instead of fishing. Collecting the eyes is pretty quick, but it requires some persistent grind session. You can easily collect 4k in an hour or two. Underbelly Tycoon achievement requires 20,000 Sightless Eyes to collect, but you don’t have to have this number on you. All earned count into the achivement. You forgot to mention that you can hire your personal “guardian” during PvP time, near the entrance by the Krasus Landing. It is eccentially a buff that lasts for 5 minutes, with a guard npc running beside you. It makes you immune to any PvP shenanigans and keep doing eyes farming from mobs/bosses. Also, the same npc who gives you this buff has option “call out guards” / “tell guards to return to their posts”, so you can change from PvP mode to PvE and vice versa. It is worth mentioning that elemental shaman’s “hidden” artifact appearance can be looted from Underbelly bosses. Besides wands for eye multiplication, the eyes can be used to buy 2-star recipes for many professions (e.g., all crafted belts have 2-star and 3-star recipes on Underbelly vendor) and the item to create temporary underbelly mount which is very useful for reaching bosses in time. It’s odd, I see so few groups these days for this. Is farming not best done in groups? Maybe I am just late to the party. You don’t need another players for this.